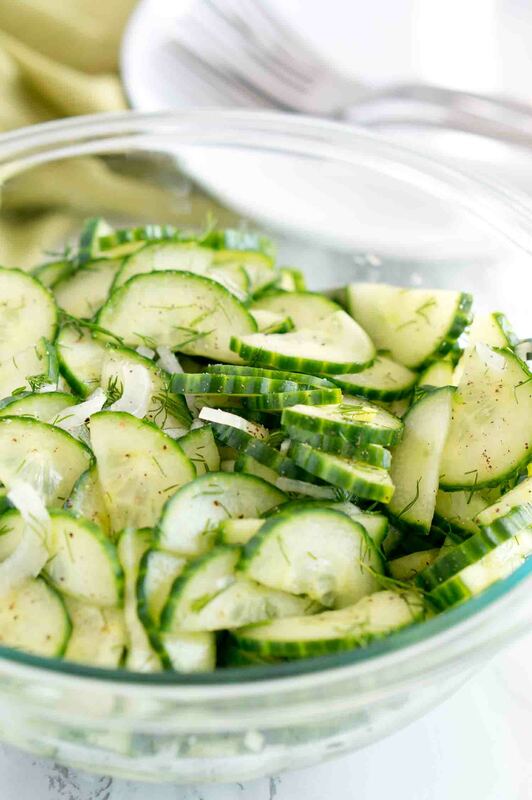 Light and refreshing cucumber salad recipe – perfect for a hot summer day. It’s a great side for just about anything you put on the grill – chicken, steak, and fish. 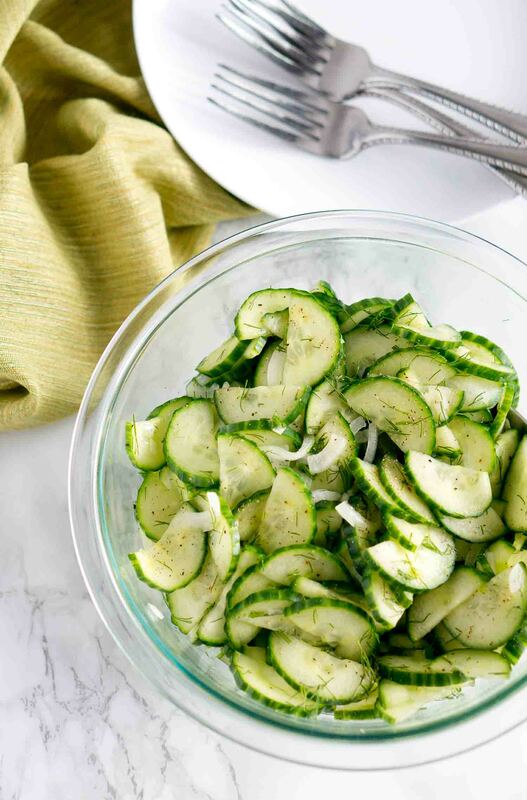 This cucumber salad is light and refreshing for a hot summer day. It’s a perfect side for just about anything you put on the grill. I like to serve it alongside chicken, fish or steak. It’s very easy to make and it takes only about 10-15 minutes to put together. It’s a great last minute side dish for your 4th of July get together or BBQ party. If you are wondering what dressing goes with cucumber salad, look no further. This simple dressing is light and delicious. It’s made with white wine vinegar, water, a tablespoon of sugar (or any sweetener), fresh chopped dill, salt and black pepper. 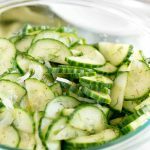 To make this cucumber and onion salad, just slice thinly the cucumbers and the onion, and stir everything together. 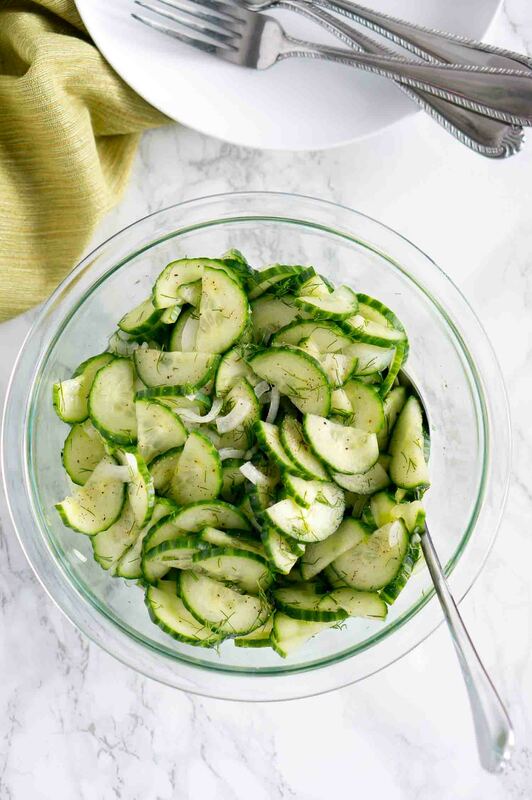 Even though the cucumber salad is very quick and easy, it doesn’t lack on flavor. 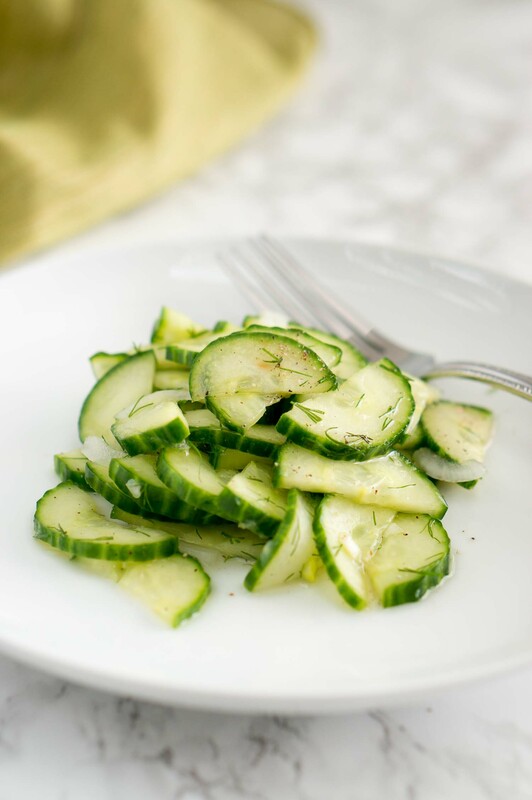 The simple dressing brings all the delicious and refreshing flavor of the cucumbers. The cucumbers are crunchy and cool. Even though it tastes great with just vinegar and salt, adding onions & dill elevates this simple salad to something more interesting. 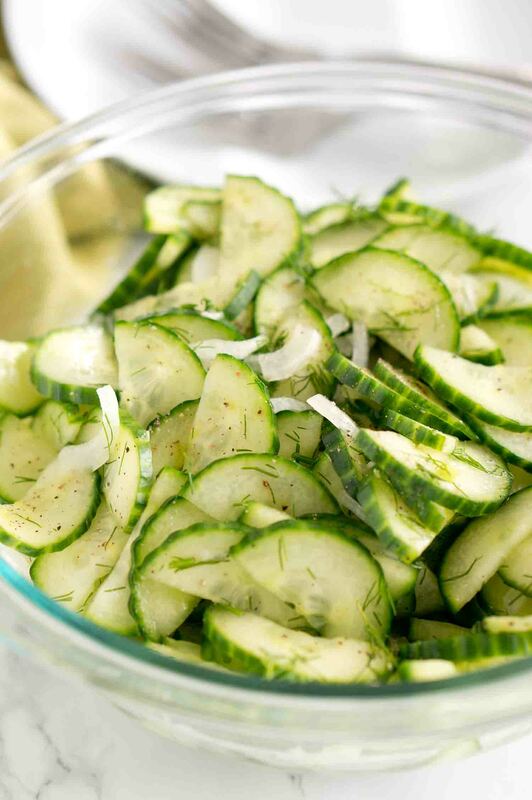 This cucumber salad is also healthy because it doesn’t use any mayo or sour cream. Also, you could substitute the tablespoon of sugar with honey or any other sweetener. I used English cucumbers, but you could use regular pickling cucumbers. If I use the pickling cucumbers, I would use 4 to substitute the 2 long English cucumbers. Also, you can serve the salad right away or store it in the fridge for an hour before serving. In general, the salad can be refrigerated for about 3-4 days. Besides my favorite go-to summer salad – Tomato Cucumber Avocado Salad – this one is my next favorite. It’s tasty, simple, and uses only 5 main ingredients. What is your favorite summer go-to salad? 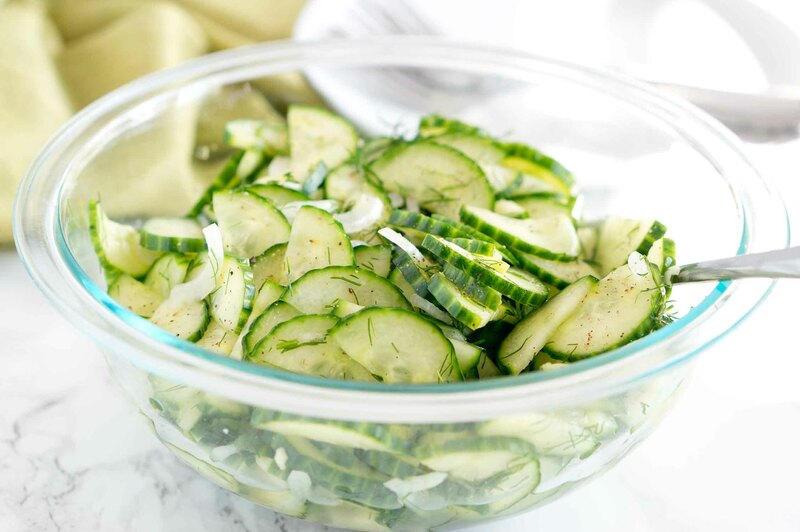 Light and refreshing cucumber salad - perfect for a hot summer day. It's a great side for just about anything you put on the grill - chicken, steak and fish. Slice the cucumber in half and then in slices. Slice the onion in thin stripes. Mix cucumber and onions in a large bowl. Season with salt and pepper. Mix white wine vinegar, water, sugar in a small bowl. Pour over the cucumbers and onions, and stir well. Sprinkle some fresh chopped dill and stir. Before making the recipe above, season the sliced cucumbers with salt and place them in a colander sitting in a bowl in the refrigerator for about 30 minutes to 1 hour. Allow the salt to draw out the excess moisture. Once the cucumbers have drained, discard the liquid and continue with the recipe. Thanks, Rivaria! It is very delicious indeed and easy to make too! Good recipe. I think the salt notation is a little confusing. Probably should read tsp for teaspoon instead of tbsp. My first try was too salty but second was just fine. can I not salt the cumber, my cousin is on a no salt diet. sure, you can skip the salt if your cousin is on a salt diet. But it won’t taste quite the same. Try adding sour cream to your taste. My grandmother did it that way & I used to love it. YUMMY..To me, this is a classic southern salad that brings back wonderful memories of summertime dinners that were full of fresh garden veggies. Thanks for yor recipe!! I made cucumber salad twice times per week, it’s same with your recipe but after salad done, I add 1-2 tablespoons of chopped dry-roasted peanuts. It make the salad more tasty. 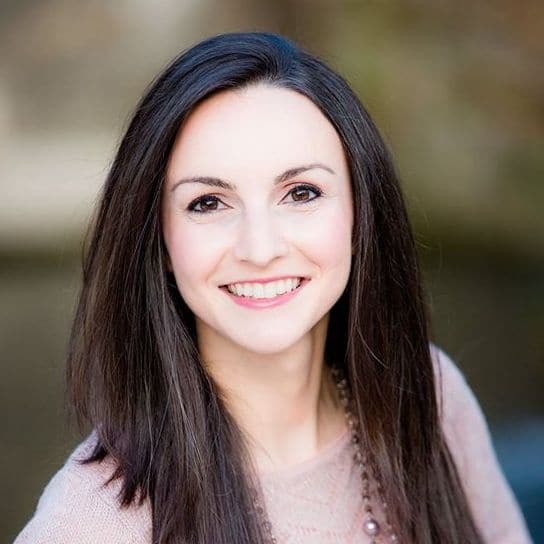 Neli, what a great idea! I love cucumber salads. Your version really pleases me very well, with ingredients that I often use in cooking too. Neli, it looks perfect and tasty! Can’t wait to have this anytime of the day, love it!